Thanks to TV series like “Portlandia” and “The Librarians,” show business is still booming in Oregon and there are still new projects in our future. Casting Director Lana Veenker stopped by KATU’s Afternoon Live on March 28th to fill in Tra’Rénee on the latest. At 8:28 p.m. on July 3, 2013, our beloved friend, mentor, director, PSU Professor Emeritus and Drammy committee member Jack Featheringill passed away peacefully from complications that developed after open heart surgery on Tuesday, July 2. Link to full Oregonian obituary. A Celebration of Life is being planned for Jack on August 19th, 2013 at 7:00 PM at Artists Repertory Theatre, 1515 SW Morrison Street, Portland, OR 97205. To accommodate expected turnout, Jack’s Celebration of Life will now take place on August 26th, 2013 at 7:00 PM at Portland Center Stage, 128 NW 11th Avenue, Portland, OR 97209. Friends and colleagues would like to thank both PCS and Artists Rep for their generosity. The celebration will include a display of memorabilia, a short spoken program, a slide show, hors d’oeuvres and a toast to Jack. In addition, PCS Armory Café will provide food and beverage for purchase. Please RSVP here. If you would like to submit a story or comment for his memory book, please follow the instructions on the form. In lieu of flowers, please make donations to CASA in Jack’s name. Marvelous, irreplaceable Jack: you will be sorely missed, but your legacy is enormous. Dec 4, 1931 – July 3, 2013. PORTLAND, ORE. Although the most passionate man in the Portland theater community passed away on July 3, his influence on actors, directors, writers, and stage technicians will endure for years to come. In recognition of the many contributions of Professor Emeritus Jack Featheringill, his friends and colleagues are hosting a celebration of his life on August 26, 2013 at Portland Center Stage. Before Jack became a theater professor—and, ultimately, the department chair—at Portland State University, he enjoyed a 15-year career on Broadway. Under the name Jack Leigh, he danced with Ethel Merman and Judy Garland, was choreographed by George Balanchine, and performed in several Broadway musicals. Working with such notables as Jerome Robbins and Hal Prince, he was also a casting director, a stage manager, and a dance captain. He cast the original Broadway production of Fiddler on the Roof with Bette Midler, and was a dancer in the movie The Music Man. After Broadway, Jack returned to his alma mater, Indiana University, where he earned a Master of Arts in Theater. Hired by PSU in 1970, he remained in the Theater Arts department for three decades. Jack was three-time recipient of the American College Theatre Festival’s Award of Excellence for his direction of productions presented at the Kennedy Center: Misanthrope (1972), Equus (1978), and Waltz of the Toreadors (1983). Also during his tenure, he ran a summer stock program at Cannon Beach’s Coaster Theatre. “Jack lived the most amazing life,” said Casting Director Lana Veenker, a close friend and former student helping to organize the celebration. “I would not be where I am today without his influence and ongoing support.” Veenker went on to found Cast Iron Studios, the Oregon casting company on Twilight, TNT’s Leverage and NBC’s Grimm. 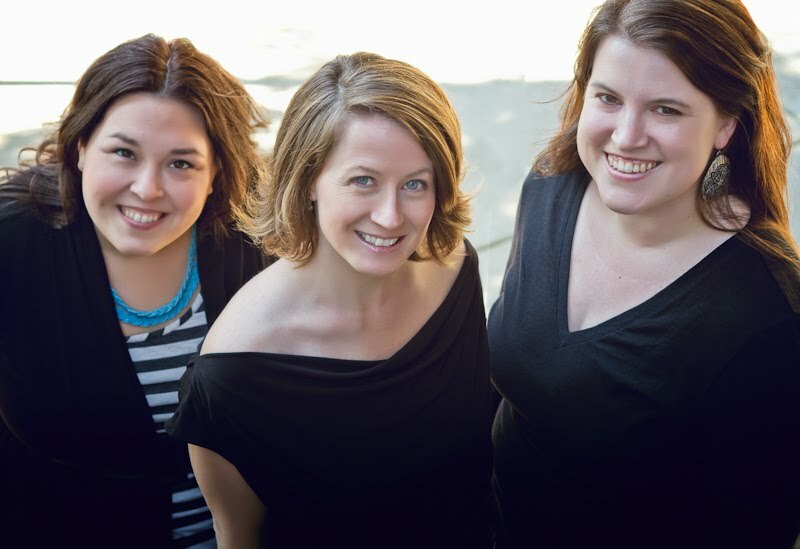 Other former students include Portland Actors’ Conservatory Artistic Director Beth Harper, Screenwriter and NBCUniversal Story Analyst Douglas Soesbe, Stage Manager Clair Callaway, Actress, Writer and Director Victoria Parker-Pohl, and several founding members of The 3rd Floor sketch comedy troupe. Jack also directed numerous theater productions in Portland over the years, coaching and collaborating with two generations of actors and stage crews. Upon retirement, Jack committed his life to helping others, working as an ombudsman for eldercare, a counselor on a substance-abuse hotline, and a Court-Appointed Special Advocate (CASA) for neglected and abused children. From 2007 through 2013, Jack advocated for his “CASA kids” with the same fierce passion and commitment he brought to teaching and directing. Jack’s love for local theater, however, was ongoing. He was involved with the creation of Portland’s Drammy Awards (initially the Willy Awards) and received the Drammy Lifetime Achievement Award in 2004. He served on the Drammy Committee from 1978 to 1993 and from 2005 until a few weeks before his death. The Celebration of Life for Jack Featheringill will take place at 7:00 PM on August 26, 2013 at Portland Center Stage, 128 NW 11th Avenue, Portland, OR 97209. To submit a story for Jack’s memory book and to RSVP, please click here. 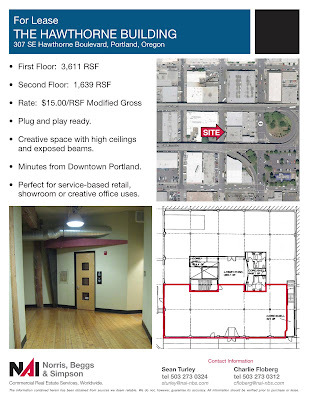 We thought we’d let our Portland film industry colleagues know that there’s a large 3611 SF creative space available in our building. We’d love to have someone else from the film industry as our neighbors! Great part of town; very industrial with cool restaurants and bars in the vicinity. Feels like old SoHo! 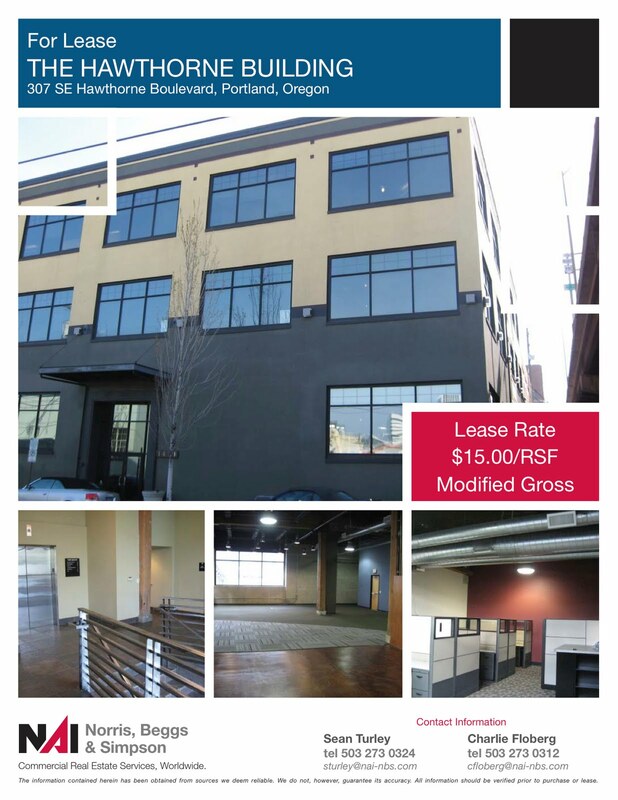 If you know of any production companies, ad agencies or anyone else looking for creative space, pass on the details to them! Let him know we sent you! Finally, some real Breaking Dawn news! We continue to be inundated with messages, emails and tweets, asking who is directing Breaking Dawn, who is casting it, where it is shooting and when auditions are taking place. For the time being, we have nothing to do with Breaking Dawn and there’s no guarantee that we ever will. It all depends on when and where it shoots and who is hired to cast and direct. None of this is in our hands, unfortunately, and we cannot reply to everyone who asks one by one. 1. Twihard Mailing List: Join by sending a blank email to twihard [@] aweber [.] com (remove the spaces and brackets). SO YOU WANNA BE AN ACTOR? Finally, if you’re trying to break into the acting business, sign up for our Tools 4 Actors newsletter, also in the right sidebar of this blog, or simply send a blank email to tools4actors [@] aweber [.] com (minus the spaces and brackets). The newsletter is full of tips and tools from Casting Director Lana Veenker, and it’s helpful for both beginners and seasoned actors. No decisions are likely to be made until the studio delivers screenwriter Melissa Rosenberg’s detailed outline to the directors. That should happen sometime next week. Until then we can just wonder how these three very diverse directors will approach Bella’s controversial birthing scene. 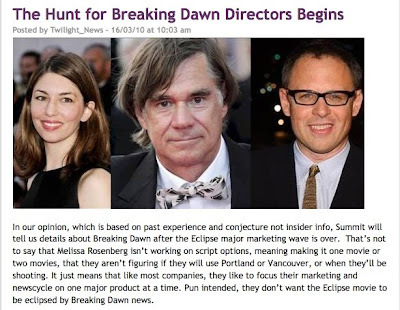 In our opinion, which is based on past experience and conjecture not insider info, Summit will tell us details about Breaking Dawn after the Eclipse major marketing wave is over. That’s not to say that Melissa Rosenberg isn’t working on script options, meaning making it one movie or two movies, that they aren’t figuring if they will use Portland or Vancouver, or when they’ll be shooting. It just means that like most companies, they like to focus their marketing and newscycle on one major product at a time. 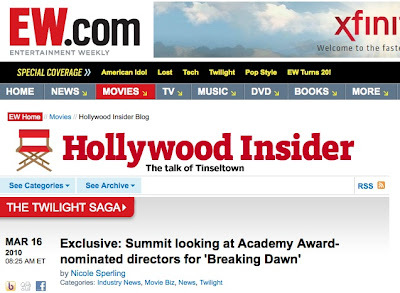 Pun intended, they don’t want the Eclipse movie to be eclipsed by Breaking Dawn news. More news about "Breaking Dawn"
More news has just surfaced about “Breaking Dawn,” the fourth movie in the “Twilight” franchise, based on the best-selling books by Stephenie Meyer. 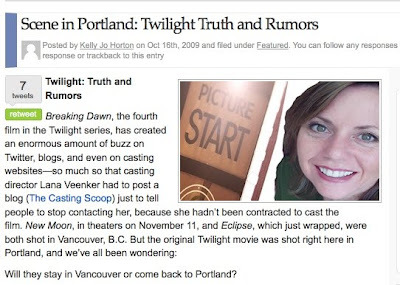 Twilight is coming back to Portland. I can’t tell you how I know this, but I know this. 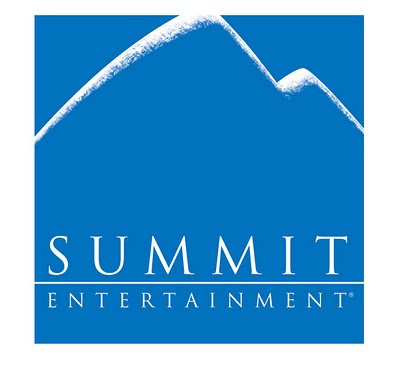 According to a very reliable source, there are two production companies involved: Summit Entertainment and Sunswept Entertainment. The movie will be split into two separate films. Breaking Dawn Part 1 will most likely begin shooting in March of 2010 (despite rumors putting the start date as September 2010), which puts filming right smack-dab on the same schedule as Leverage. Portland will look like the backlot of Universal with Leverage and then the two Breaking Dawn movies shooting back to back. There is no need to inundate our mailboxes with materials (or goodness forbid, swamp our phone lines or email inboxes). Our small staff and limited resources make it impossible for us to consider ANY submissions or inquiries at this time. Please save your money and spare us from the onslaught! To keep updated on any Twilight-related news we may have, subscribe to our Twilight mailing list, by sending a blank email to twihard@aweber.com. You can also keep an eye on this blog for news and/or sign up for the RSS feed on the right sidebar. We assure you that any information worth sharing will immediately be posted here and sent to our mailing list. NOTE: This is a different mailing list from our Tools 4 Actors newsletter. If you want to receive Lana’s acting tips and tools, use the form on the right sidebar of this page. We are all hopeful that the news is accurate, but for the time being, we’ll just have to wait and see. We appreciate your help in keeping our lives manageable! Word has been flying around the blogosphere that “Breaking Dawn,” the fourth film in the “Twilight” series, may be shooting in Oregon next September. For the record, we have not yet been contacted by production about this possibility and have not been hired to provide casting services. We appreciate your understanding and hope to have more information for you in the future. Thanks to all the participants in our rare signed Twilight poster contest. We will be looking through all the submissions and announcing a winner soon. Thanks for the input, Twilight fans! Thanks for all the great ideas for what to do with the five rare autographed Twilight posters from the DVD release party. We’ll be going through all your suggestions and post a contest soon! In the meantime, keep abreast of our acting tips and tools by subscribing to the Tools4Actors newsletter in the right sidebar. Sign Up Now to be an Extra on TNT’s "Leverage"
GOOD NEWS! Our new extras casting system is inching towards completion!! We’re now able to access and search the new online database, so our registration process has been streamlined and it is no longer necessary to register using the old system. If you haven’t registered yet, an update on how to do it is below. If you have registered, but haven’t uploaded a digital photo yet, your profile is useless to us! You MUST upload a current photo in order to be considered. Rutabaga Background Casting, a division of Lana Veenker Casting, is urgently seeking individuals based in the Portland area who are interested in working as extras on the TNT television series “Leverage,” shooting in and around Portland through mid-September. We need extras of all ages, types and ethnicities. * Click on “New Profile” on the left side of the home page, under the login button. * Select Account Type (scroll to bottom for free Basic Account). * Enter your information completely and follow the instructions you will receive in an email as to how you can upload your current picture. * It is very important that you immediately upload your photo on Casting Frontier in order to be entered into the database. You cannot be considered for extra work without a photo. We will be in contact with individuals who fit the specs for each episode. To help us maintain our sanity, please do not call, send multiple emails or drop by the office. Extras earn minimum wage (eight-hour minimum, regardless of hours worked), plus overtime pay after eight hours. Shoot days are sporadic, but long (can be 12 hours or more) and extras are required to be 100% available on their work dates. Rutabaga Background Casting does not charge extras any fees to be listed with its company. There is no charge to create a basic profile and no requirement to upgrade to a premium account. We’ll be making an official announcement about the casting of “Leverage” shortly. In the meantime, professional actors based in Oregon or Washington who do not have representation in Portland or Seattle can mail their (stapled) headshots and resumes to Lana Veenker Casting, 2580 NW Upshur Street, Portland, Oregon 97210, including their contact information and union status. Actors who are represented by talent agencies in the Northwest are already on file and do not need to submit their details by mail. Individuals interested in working as extras can email leverage[at]sayrutabaga[dot]com to be added to the list of people to contact when the extras division is ready to start casting. It is not necessary for extras to email photos or other attachments at this time, as a new casting system is in development and will be announced shortly. Please note that we cannot accept drop-ins or telephone calls regarding Leverage, as the volume of inquiries would be unmanageable. All casting news will be posted here as it becomes available. Late notice, but Lana will be on KATU’s AM Northwest program tomorrow morning (Wednesday) to talk with Helen Raptis and Dave Anderson about Oregon’s film incentive program and the economic benefit it brings to the state. She also will be announcing casting information about upcoming projects. Be sure to tune in….